It’s time to start thinking outside of the box when it comes to your vacation rental. 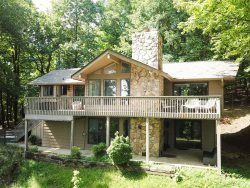 With homes that combine the luxury of a hotel suite with the breathtaking views and unique architecture of a tree house, Mountain Vista Rentals offers visitors unforgettable alternatives to ordinary Appalachian cabin sites. The home’s interior is superbly decorated, maintained and regularly cleaned. Outside, you’ve got an escape from it all complete with eat on deck, a wrap-around porch. There’s central air conditioning to keep you and your fellow guest cool, a tranquil living area and two adjacent parking spots.